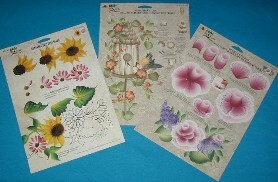 Unique plastic laminated worksheets allow you to practice ONE Stroke painting with FolkArt until you have it PERFECT. Once you learn ONE Stroke, you can paint hundreds of projects on any surface! Scroll down or Page down to see the Reusable Teaching Guides. ONE Stroke Painting is sweeping the decorative painting world. It's fun; It's easy; It's quick. You get great results from your first lesson, even if you've never painted before! to make your own ONE Stroke projects! including payment details: CLICK HERE! Our web site is our catalog. Please print these on-line lists if you need a reference copy. Items marked LIMITED AVAILABILITY - ONE PER CUSTOMER are limited in quantity because they are not readily available. To make them go around, we can only ship ONE PER CUSTOMER to any address. CONFIRM YOUR ORDER BY eMAIL to assure availability! All RTGs are $3 except the smaller ones which are $1.75. Click on the image in the first column for more detail. The United State Post Office mailing rates are distance and weight sensitive, always rolling to the next pound rate. Rates will change in the future.